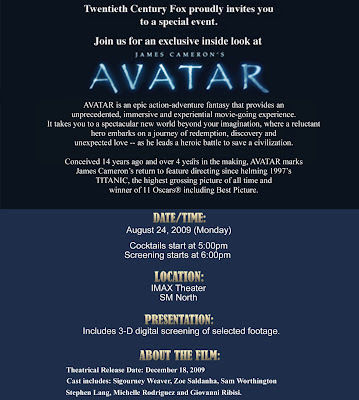 Just like what I've reported previously, James Cameron's Avatar will be having an exclusive Sneak Peek on IMAX tomorrow at SM North and I still have extra 2 slots for the screening. But since its a limited pass, I want to give it to those worthy of the passes. So here are the mechanics on how to avail the passes. 1. Answer this: Give me the name of this actor and actress in Avatar. The actor is also in Terminator Salvation and the actress is in the latest Star Trek flick. 2. Digg and Comment on my previous post. 3. Here is the content of the comment: Answer to the question, Name, Blog URL, Digg username. The promo will close tomorrow Lunch time so hurry up and Good luck.